On a humid morning and afternoon, almost 500 D.C.-area runners finished the Boston Marathon. Jordan Tropf, a 27-year-old medical resident from Silver Spring, led local finishers in 61st place, 58th among men, in 2:27:21. McLean’s John Brough, 23, a Bishop O’Connell alumnus, ran 2:29;33 to lead Northern Virginians in 93rd, 87th among men. Steven Bance, 34, was the top man from D.C., finishing 99th overall, 92nd man, in 2:30:21. Chantilly’s Christine Westcott, the 49-year-old winner of February’s George Washington Birthday Marathon, was the top local woman, running 2:58:48 for 148th woman and 2348th overall. Montgomery Village’s Elizabeth Conlon, 27, who ran at Good Counsel and Georgetown, was the 160th woman across the finish line and 2476th overall, running 2:59:20. Annyck Besso was D.C.’s first woman, 267th place and 3361st overall in 3:04:36. Kenya’s Lawrence Cherono won the men’s race in 2:07:57 and Ethiopian Worknesh Degefa won the women’s race in 2:23:31. Bethesda’s Ben Beach ran his record 52nd Boston Marathon. Lindsay Flanagan, formerly of Silver Spring, was the ninth woman across the line in 2:30:07. As always, please let me know if we’ve left anyone out or used clock times instead of chip times. 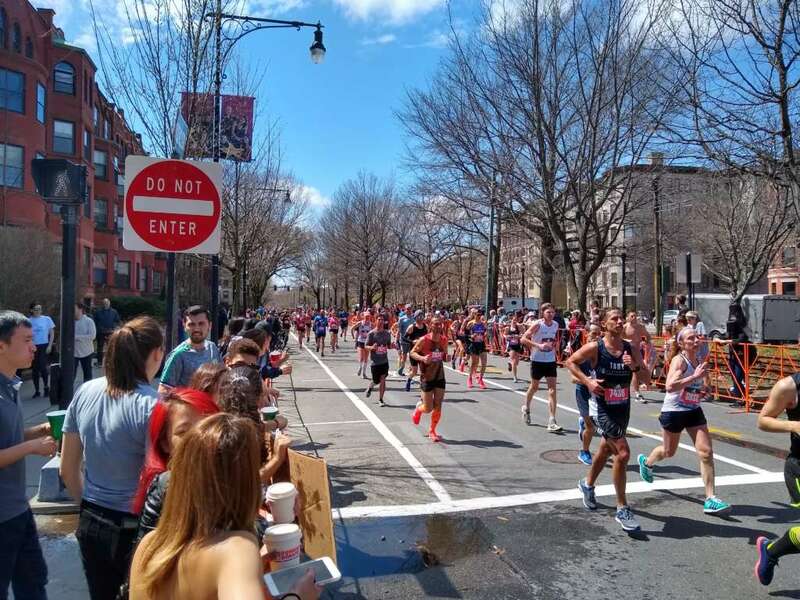 Residences are as reported to the Boston Athletic Association on race registrations, so some people may have moved in the meantime. After a second check of results, I believe we’re “there” now.